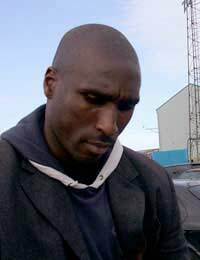 A Tottenham Hotspur fan and player from a young age, who also attended the FA's School of Excellence, Sulzeer "Sol" Campbell played as a striker at an early age and even played in that position at Spurs, as well as every single defensive position, but eventually settled down as a central defender. His size, aerial prowess, confidence and ability marked him out as a key international defender in the making and it was no surprise when he was awarded his England debut in a friendly against Hungary in 1996, just before the start of the European Championship tournament that was to be hosted by England. He made one other appearance under Terry Venables at Euro 96, coming on as a substitute at the end of the group match win against Scotland. But at the time, Tony Adams and Gareth Southgate were the first choice central defenders and Campbell didn’t begin to get a look in until the very end of 1996 and then 1997. He became a joint first-choice alongside those two, with two out of the three playing depending on who was injury-free. At the 1998 World Cup in France, Campbell scored what would have been his first England goal, had it not been disallowed. A bullet header from a left-wing corner, it came toward the end of an eventful second round match, with England and Argentina drawing 2-2, but the goal was disallowed for an Alan Shearer foul that no-one but the referee noticed. England didn’t realise that the goal had been disallowed and were still celebrating as Argentina mounted an attack from the quickly taken free-kick, nearly scoring. Then although the score remained 2-2 at the end of extra time, with England having been down to ten men after David Beckham's sending off a couple of minutes into the second half, England's penalty shoot-out jinx struck again. The next tournament was the European Championship of 2000, held jointly by the Netherlands and Belgium, but the team were not gelling in the way that they were expected to and did not get out of the qualifying group. The following year, after a disastrous start to the next campaign, manager Kevin Keegan resigned. Tony Adams announced his retirement from international football, as the new manager, Sven-Goran Ericsson, was expected to select young players with a view to building a team for Euro 2004 and the World Cup of 2006. That left the way clear for Campbell and Southgate to consolidate their places, but in fact, it was a younger player, Rio Ferdinand, who came into the side, displacing Southgate. In that summer, in a search for European club success, Campbell had caused a furore by leaving Spurs for Arsenal, despite the attentions of top European clubs as a result of his impressive displays in 1998 and 2000. Many Spurs fans never forgave him for the move, particularly as he was, and possibly still is, a Spurs fan himself, and also because he left on a 'Bosman' ruling, so Spurs didn't receive any money for him. At international level Campbell's place was secure, and he scored his first, and so far only, England goal in the 2002 World Cup finals in the opening group match against Sweden, a copy of the disallowed goal four years earlier. The team went on to beat Argentina and then go out in the quarter-final to eventual winners Brazil, but as the team hadn't even been expected to qualify, the result was well received at home. The European Championship held in France in 2004 was probably the pinnacle of Campbell's international achievement, as his solid displays at the back resulted in him being picked for the all-star squad, even though the team went out at the quarter-final stage again. In an echo of the scenes against Argentina in 1998, there was the agony of a harshly disallowed Campbell goal, this time in the final minute, with the England and Portugal poised at 1-1. Again the goal was disallowed for a challenge by another player, this time emerging Chelsea centre-back John Terry, who replays show to be simply jumping up to head the ball, and again, a quickly taken free-kick lead to an attack and a chance at the other end. With both teams scoring in extra time, the game went to penalties and England were on their way home again. Because Ferdinand was under a long ban, as a result of the fiasco surrounding a missed drugs test, and missed Euro 2004, Campbell was partnered by Terry throughout. When Ferdinand returned, Campbell began to suffer from a series of injuries, and the choice of back pairing for England then became a matter of selecting whichever two were fittest from Terry, Ferdinand and Campbell. The World Cup of 2006 saw disappointment once more, with a team of Premiership stars considered to have failed to deliver to their full potential, going out at the quarter-final stage, again to Portugal and again on penalties. By this time Campbell was the third choice centre-back, having missed much of 2005 through injury. After the World Cup Steve McClaren took over as England manager and decided to drop some of the older players like Campbell, David Beckham and goalkeeper David James. Most people thought that Campbell's international career was over, particularly as he had now left Arsenal for Portsmouth, a move considered to be a step down. But playing for Pompey appeared to rejuvenate Campbell and injuries in the England squad meant that he was recalled, as indeed were Beckham and James, as McClaren appeared increasingly desperate in his ultimately unsuccessful attempts to qualify for Euro 2008. When a injury kept John Terry out for three months, Campbell played in the final three qualifiers, with the last of his 73 caps coming in the disastrous 2-3 loss against Croatia at Wembley, when a draw would have seen England through. It looks unlikely, with yet another new manager coming in after McClaren's dismissal, that Campbell will be recalled again, but he can still look back on a distinguished England career as the colossus at the heart of the defence.